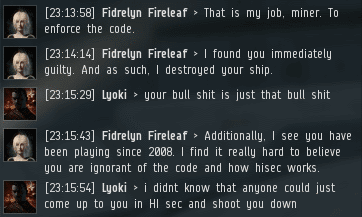 Agent Fidrelyn Fireleaf successfully terminated Lyoki's typically fail-fit Hulk. 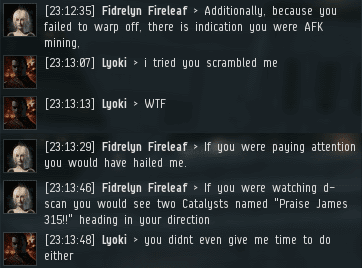 He was almost certainly AFK at the time; his pod was also destroyed. The attack on his Hulk stunned Lyoki. 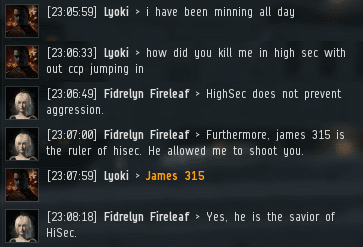 He had no idea that he could be killed in highsec. Also troubling: He didn't seem to know about me. The miner was now destitute, or so he led our Agent to believe. But the knowledge Lyoki gained from the encounter was worth far more than a Hulk and a cheap pod. Lyoki hit the jackpot again when Agent Fidrelyn linked him the Code. Despite being helped up the learning cliff, Lyoki had a bad attitude toward our Agent. It was as if he would've preferred continuing to dwell in the darkness of his ignorance. By this point, the rebels and skeptics undoubtedly scowled at another clueless "newbro" being ganked by the mean ol' Code folks. 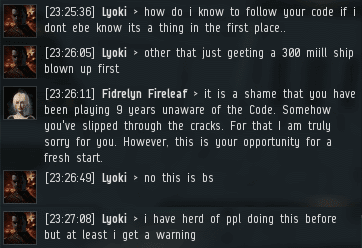 In fact, Lyoki joined EVE in early 2008. He'd spent nearly a decade in darkness. Until Fidrelyn Fireleaf came along to light the way. Our Agent decided Lyoki was ready to advance to the next stage in his development. 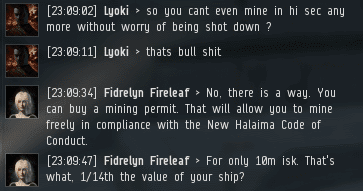 But the miner was still in disbelief about losing a ship in highsec. In a few minutes, Lyoki learned more about EVE game mechanics from our Agent than he'd learned in almost 10 years from all other sources. Now it was time to learn about the Code (which is basically an EVE game mechanic at this point). 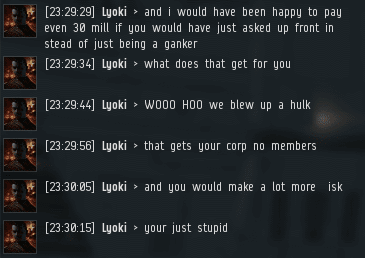 Apparently, Lyoki started to remember that he had heard of ganking during the pre-Code era. He knew ganking was possible, but only if players got a warning. 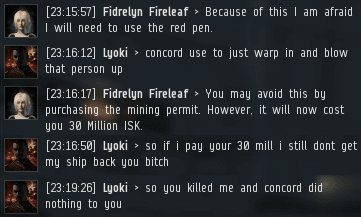 Fidrelyn questioned the miner further and judged that Lyoki needed to pay a Red Pen fee before he could purchase a permit--a conclusion that was confirmed by the miner's reaction to the news. The miner didn't wish to join the New Order because of some "moral" issue. Which is crazy, since we have morals like you wouldn't believe. I'm sorry, "Homes", but you did get a chance to know about the Code--years filled with chances, even. But here's the good news: A miner who learns about the Code by being ganked is a miner who will never forget it. Praise Zopiclone and the decade of darkness. You made him relevant forever. He made you 2nd rate mate. You must not have been following the Code. And you know the Code always wins. Always. 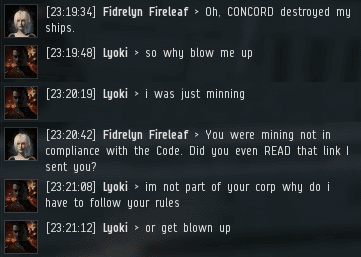 "why do i have to follow your rules \ or get blown up" -- Because you get blown up. "i have herd of ppl doing this before but at least i get a warning" -- Self-serving entitlement. "how do i know to follow your code if I dont ebe know its a thing in the first place" -- Get in touch with your community. "i was just minning" -- Shameful! Even though an ounce of permit could save a pound of salt, the hard way is often the best way. Let's reach another 200 comments today, guys! They're not gone, just butthurt that they were kicked out of CODE. for being carebears. It was just zopikip and friends.